Barnes & Mullins "the Gresse"
This is a Chinese made spruce and spalted maple Tenor branded by Barnes & Mullins and called "the Gresse"; it is pretty much new and ex display. I found it on ebay listed "for parts only" as it has a bowed neck. 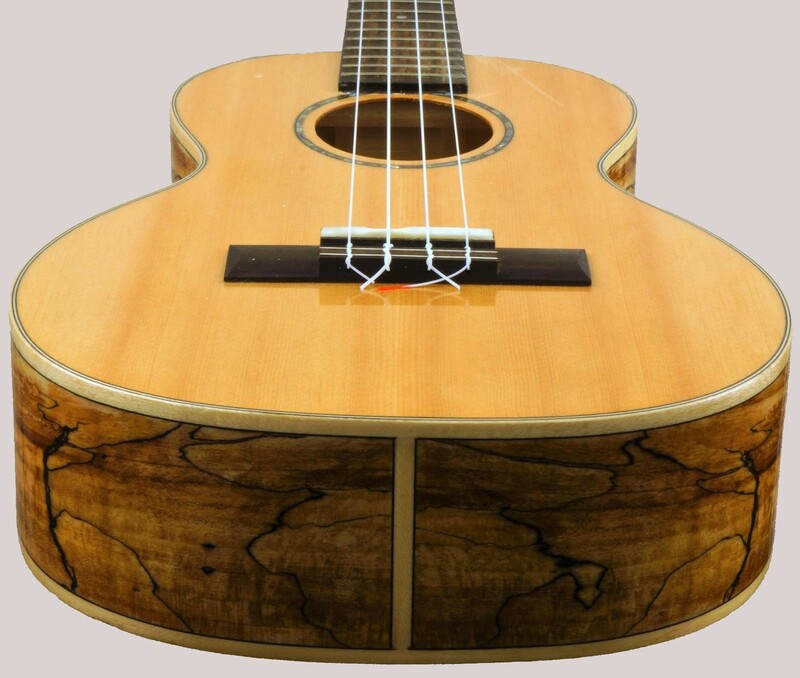 However it doesn't look that bad from the pictures of it taken side on, and Barnes & Mullins Ukuleles are pretty reasonable quality so worth a punt. The Ukulele itself looks quite pretty and even if it is unplayable I can always have it for display so I bid on it, (that and it had a very, VERY, VERY low starting point). I put in the opening bid, (plus a little but I didn't go to high in case it was unplayable), and, possibly because of the damage listed, no on else bid, so I ended up getting it for a lot less than it was going to cost me to ship, (and the shipping wasn't particularly expensive). All I can do now though is wait until it arrives so I can see how bad the neck is; hopefully not too bad? It's arrived now and I can't see a bow at all?? I have checked the intonation on all strings and it is very good; probably no more than 5% out at any point. There is a bit of a scratch: more of a scuff on the upper left bout but that is the only thing that stops it being new, and fully justifying the retail price not the price I paid for it.